Many generations ago, the evil Ganondorf returned and no Hero appeared to stop him. Hyrule was flooded in a Great Sea to prevent the evil king from acquiring the Triforce. 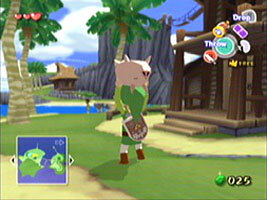 On Outset Island, a young boy named Link is celebrating his birthday by dressing in the garments of the Hero. His sister Aryll is kidnapped by the Helmaroc, so he join a pirate crew led by Tetra to mount a rescue. He fails but is united with a talking boat named the King of Red Lions. Link must travel the Great Sea and control the winds with the Wind Waker as he faces his destiny as the Legendary Hero if he is ever to rescue his sister and stop Ganondorf's plan to uncover the Triforce. On one of the islands near Forest Haven you will find the Nintendo Gallery where Carlov the sculptor transforms photographs into figurines. A Lon Lon Milk poster, and several empty milk bottles. Some suggest this is a parody of Nintendo's situation, as they were losing their share of the gaming market to "cool" competitors. Also hanging around the Nintendo Gallery is a fan named Manny. The design on his satchel is an 8-bit Octorok sprite from The Legend of Zelda. "Winner of the Perfect Attendance Award"
This is in reference to the Octorok being in every Legend of Zelda game (at least up until the release of The Wind Waker). In the chamber of the lost Hyrule Castle where you find the Master Sword, there are seven stained glass windows around the edge of the room, each depicting the seven sages from The Legend of Zelda: Ocarina of Time. The Tingle Tuner is shaped like a Game Boy Advance. If you use the Tingle Tuner on Outset Island, Knuckle will walk you through a scavenger hunt minigame. Clear all four stages and he lets you use his Hand-Me-Down Tingle Tuner as a submenu for the regular Tingle Tuner. The Hand-Me-Down Tingle Tuner is a light blue Game Boy Color. In the Pikmin series, the red, blue and yellow Pikmin each have the same defining characteristics. The working title for the GameCube was the Dolphin, and a number of Nintendo games make reference to this name. In The Wind Waker, the old man on Outset Island who teaches you how to use your sword is named Orca. Orca, more commonly known as the Killer Whale, is the largest member of the dolphin family. 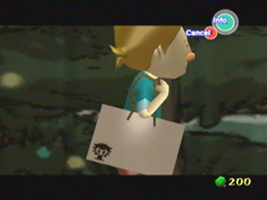 Each character in the Hylian alphabet represents a letter in Japanese, and so it is possible to translate the Hylian text that appears throughout the game. The Hylian writing on the Phantom Ganon enemy's sword reads "Zubora Gabora". Zubora and Gabora were the names of two blacksmiths that lived on Snowpeak in The Legend of Zelda: Majora's Mask. 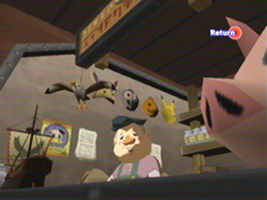 Lon Lon Milk and Deku Nuts both featured in The Legend of Zelda: Ocarina of Time and Majora's Mask.